My experience with Medical Cannabis Association MEDCAN has been overall positive. I was welcomed at the clinic by Andrea, a wonderful, knowledgeable and patient person that was willing to answer all the questions I had. She took me in a tour of the cannabis clinic explaining about all the services, facilities and products they have to offer. 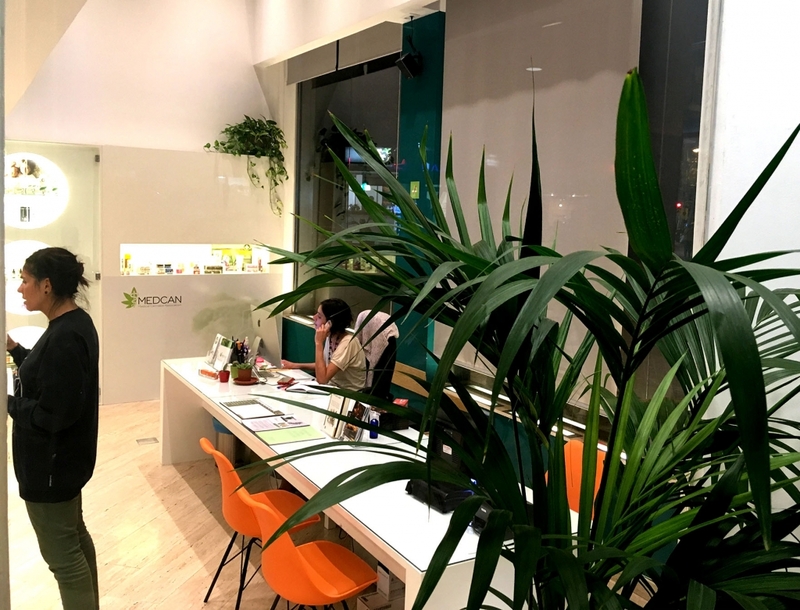 This information center about the therapeutic use of cannabis opened in Barcelona in the year of 2017. It is getting fast a good rename being one of the pioneers in the medical cannabis field of Europe. Inside, the feeling is like in a real medical clinic without the smell of disinfectants or medicine drugs. A good relaxed vibe, combined with the professional image of the place gives me the feeling that this center will really have an impact. The center can help many people by informing how cannabis and the cannabinoids can be used as therapeutic agents. At Medcan, marijuana-savvy staff wearing white scrubs welcome clients to a facility that is decorated with the crisp simplicity of an Apple store: glass transparent windows to the street, white walls, white tables with orange accented chairs, information boards and a glass case displaying a wide selection of products derived from hemp and its seeds. In the back corner are two private rooms, where the formal meetings or telemedicine conferences take place between the Association’s members and specialized doctors in endocannabinology. The center also offers medical reports to users for therapeutic reason. It also offers physiotherapy service, with doctors like Albert Estrada Zambrano, for patients who need joint relief or muscle pain using the best oils and creams made from cannabis. Since physiotherapy is all about strengthening the body through exercise and movement to heal properly, it can also be painful. It’s because of this pain that physiotherapy patients are looking to medical cannabis. One of the most common reasons patients use medical cannabis is because it’s a painkiller. Medical marijuana also isn’t addictive, which is why so many people who are suffering from pain are using it. It’s a great alternative to opioids. It’s also been proven to help effectively treat pain. The National Academies of Sciences, Engineering and Medicine (NASEM) conducted a study called “The Health Effects of Cannabis and Cannabinoids,” which reported there was conclusive evidence that cannabis or cannabinoids can be effective in treating pain. Being able to take medical marijuana while working through physiotherapy allows a patient to help their body recover to its fullest capabilities, while not being hindered by pain. Medcan’s team is always available for talks and debates about medicinal cannabis. They also have a special area that can guest up to 25 persons in a nice comfortable meeting room where they hold trainings on the therapeutic use of cannabis, debates, brainstorming’s and all type of assistance. If you have a social cannabis association or a conference area, they are willing to come and hold the talks and trainings at the side where also certificates are offered at the end of the curs. In the clinic you can find a large variety of hemp-based products like sublingual oils, CBD crystals, Pills, cannabis creams and ointments, CBD nectar, Hemp seed extract products, Body treatments, Facial treatments, Personal hygiene. Also, a section of Desktop and portable vaporizers, Precision equipment, advice and protocol assistance on how to use the vaporizer for therapeutic patients. The Nutritional category has its place also, you can find food supplements, hemp seeds, pasta dough products, coffee and tea infusions. They offer a wide collection of books, scientific texts and videos related to the cannabis plant and its therapeutic potential in a reading room and video library. A big appreciation for Medcan’s vision to be the leading medical cannabis education source for patients, healthcare providers, and associations. With a beautiful mission to empower patients and healthcare providers with knowledge to destigmatize cannabis as a medication and cultivate a community of health and well-being.